If you leave your printed coupons at home, don't want to pay for ink or waste paper, or for some reason forget to download the digital coupon to your phone, do you still purchase the product when you see it on the physical store shelf in the store? Money doesn't grow on trees, and every penny counts -- even if the government now tells us it takes 1.5 cents to manufacture one penny. So, I asked Mike Scriven, VP of client marketing at Coupons.com, that question after reading a study released by the company Thursday. "The short answer is yes," according to Scriven. "Often consumers who forget their coupons for whatever reason do end up buying the product anyway," he said. "We refer to this as the incremental lift above and beyond the coupon redemption itself." Coupons.com has not studied this specific phenomenon yet, but Scriven did in the past -- and found a fairly significant lift where consumers who are exposed to the coupon but don't end up using it buy the product anyway. I do it all the time. I would clip the coupons and forget to bring them with me. Digital coupons help in that respect. But you have to admit, as Scriven puts it, that coupons do provide brand recall and play a supportive role when it comes to advertising and marketing. On a side note, but also along the same lines, Scriven said that sometimes consumers who use coupons buy more volume then the coupon requires, and this produces tremendous incremental volume lift for the brand, too. Brand favorability really spikes when consumers get to use a coupon to buy their products -- and it makes them feel good. When it comes to groceries, I have a very good friend who will only buy items on sale or with a coupon. Some grocery stores, such as Vons and Stater Bros., have begun to personalize digital coupons based on past purchases. 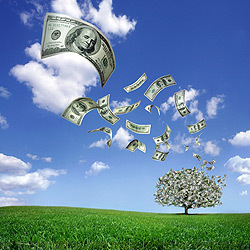 "Money Tree photo from Shutterstock"